Caption slip reads: " (Agriculture feature). Photographer: Monteverde. Date: 03-20. Reporter: dunn. Assignment: Vegetable industry. 7-8: Owner Y.C. Reys plants young tomato plant before capping against frost. Reyes Ponce, a worker, weeding between capped rows of tomato plants on 20-acre farm. 84-85: Celery farm of 80 acres being planted in Dominguez area. 3-4-80-81: Workers planting celery in 80-acre field. 41-42: Mrs. L.J. 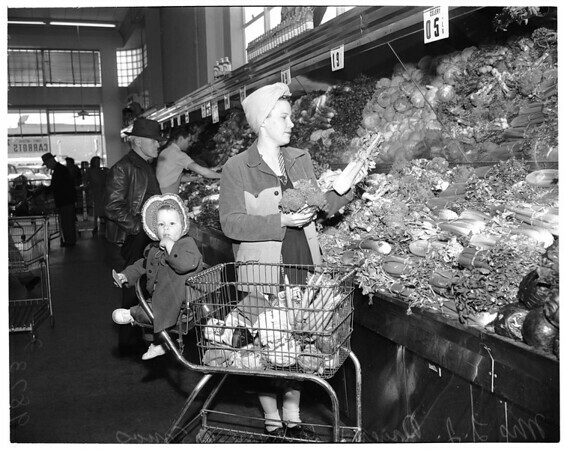 Boyer selects fresh vegetables at super market, with 15-mo.-old daughter, Yvonne."